We are the manufacturer so you save by dealing direct. Let us put our renovation team on your project and get the job done right the first time. We are your one stop source for all of your renovation needs and we offer free estimates and references upon request. 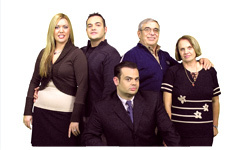 Call Piero for a no-obligation consultation. Newbie boss, Piero Pasquariello, tries to fill his father’s shoes in running the family business - Valentini Kitchens and Bath. He’s counting on his wife and brother to help because when it comes to business, Piero’s greatest asset is his family. It’s also his greatest challenge. Sundays at 6pm/et on TLN. on quality workmanship. Family owned & operated for over 30 years.